Help! Stepping Out of My Comfort Zone – Can You Share Some Blogging Etiquette? How silly is this, writing my very first blog post and I don’t have a single follower? I might as well be writing to a black hole in cyberspace or talkin’ to an invisible wall. I’ve been following a few blogs to see what it’s all about. A bit overwhelming, to say the least. There are millions of you out there. I’m but a tiny speck, smaller than the itsy bitsy spider on your local web. It reminds me of one of my favorite Dr. Zeuss books, “Horton Hears a Who.” Hello, hello, is anyone there? Can you hear me? I suppose it’s all a matter of perspective, and one should keep in mind, after all, that a blogger’s a blogger no matter how small! Anyhoo, if you’re there, anyone, anywhere in the worldwide blogosphere, before getting my feet wet, I need help from you. The last thing I want to do is to start off on the wrong foot, step on your web toes, and be written off as a cyberspace case who’s throwing a party, but nobuddy comes. So, do you have any tips for good etiquette in blogging? This entry was posted in Grammy Gets It, Lynn Kelley and tagged Uncategorized. Bookmark the permalink. 42 Responses to Help! Stepping Out of My Comfort Zone – Can You Share Some Blogging Etiquette? Welcome to the Blogosphere, Lynn! Great-looking blog! Try getting the book "Blogging for Dummies." Or do a search on the Internet for "Blogging Etiquette." Thanks, Carol. You're my first guest! Yes, I'll have to do a search about the etiquette. Aha, I get to be your very first follower. Enjoy! Talk to you soon. "A blogger's a blogger no matter how small!" You are too funny and that will take you far in the World of Blog. Happy Launch to you. Omigosh! I nearly fainted when I saw three followers! What a thrill after such a trying day! Woo hoo!Maria and Stephanie, I think it's a tie as to which of you was first because you must have been commenting at the same time! And, Maria, it took me another hour and a half after I called you to figure out what the problem was. Yep, white font on a white background just doesn't cut it! Tricia, thanks so much for all the tips helping me get started on my blog. I'm thrilled you signed up to follow. Thanks for all your encouragement. You guys rock! Hey LynNerd,great to see you here, too 🙂 Love the photo. When it comes to stepping out of a comfort zone, you rock! Wen, I love "bloggiverse." Very cool term. Your blog etiquette is fine. I've been learaning a lot from following you. Yay, you're my fourth follower. This is pretty darn exciting!Rillie, Thanks for stopping by. I'm glad you like the photo, and you're pretty good at stepping out of your comfort zone, too. I couldn't have done that schmooze presentation without following your lead. Hi Lynn, Congratulations! I love, love , love your sense of humor! LynNerd–Thanks for stopping by my blog, and congrats on your first blog post. I hope you find the blogging community to be a supportive and kind one–I certainly have. As far as etiquette goes–I think the saying do unto others works pretty well. Although Elana Johnson has some straightforward advice on blog building here: http://elanajohnson.blogspot.com/p/building-better-blog.htmlI'm glad you're here! Hi Melody! Thanks for checking out my blog. I'm so glad you think my post is funny. My goal was to make people chuckle.Hello Heather. Great etiquette advice about do unto others, and thanks so much for Elana Johnson's link. I read her posts right away, and what a huge help. Now, that's what I call getting support from the blogging community, so thanks again, Heather. That's the kind of help I was looking for!Hey Margo, You make the adventure sound like a blast. I hope it is. So far, I like it! Thank you for stopping by and for the two referral links. I'll check them both out. Laura Pauling also mentioned Lisa Gail Green's post for today about blogging etiquette. What a coincidence that there's a perfectly-timed post that specifically answers my question. You can bet I'll check out both links you recommend. Thanks a bunch! Hi Lynn! Heather sent me. She said you're "nice and funny." Welcome and rest assured hat you are not invisible. OMG I LOVE THE PICTURE!! 😀 Thanks for stopping by my blog, I'm glad you found it useful. I'm sure you'll do well. It's pretty hard to step on Webfeet. Good luck! Hot dog, Jonathan! I just went to your blog and left a comment thanking you for stopping by my blog. When I got back here, I noticed that you signed up to follow me, too. Thanks so much! And it's good to know that I'm not invisible after all!Hi Lisa, I'm so glad you like the silly picture. It kind of captures the true me! When I figure out where the heck some video clips of me are in this new Mac laptop of me trying to figure out why the heck the preview of the book trailer I was working on wasn't playing, I'll have to post them. I'm sure I look like a complete imbecile searching the screen, wondering why the trailer wasn't playing. I accidentally hit the "record video" button instead of the "Play" button. Bet I look like a contender for beauty queen webster – Swollen red eyes (from tears of frustrataion due to trial & error, delete, trial & error, delete. Still in my PJ's at the end of the day, hair all ratty.) I wonder if anyone would believe it's real and I'm not putting them on. I wonder where my computer stored it. Hmm. . .Anyway, thanks for your great advice and for the well wishes. Heather, thanks so much for sending Jonathan my way. He's very humorous. I think I'm going to love following his blog! Welcome to the fun-land! Blogging is great, but you have to find your groove with it. The only way to do that is to wade in and start – which you're doing! So, go you!I might have to do a post on blogging etiquette, but Lisa Gail Green just did one and it's awesome.Best of luck to you! Hi SuperB! So glad you visited my site. I'll be very careful not to write about anything that would embarrass the family! Haha! Hello Susan. Thanks for stopping by. You're so right about having to find your groove. I like reading everyone's blogs and the comments, but I can see it getting quite overwhelming if you try to follow hundreds of blogs and keep up with it all. So I'll wade in slowly. Thanks!C. Lee, you're welcome. My other advice would be to have fun. That's what it's all about. I hope your interview rocks. That will be a big feather in your cap. Let us know when you post it. Sharon, Thanks for visiting my site and for signing up as a follower. I agree that blogging is a super way to meet other writers. I think it will be fun and interesting to follow everyone's progress. So far, yes, I'm finding lots of support from the blogging community. Love it! welcome! You already have 14 followers so you are doing well. I don't think there is any real blogging etiquette except the standard social etiquette found in real life. Lynda, thanks for stopping by and signing up. I visited your blog and also your CPs new blog. Very cool!Susan, thanks for mentioning me in your blog. Your heart-felt advice about blogging is very much appreciated. Nice job.Hi Chantele. Thanks for your comment and for signing up. Excellent advice about not ranting about huge topics. I imagine it's easy to carried away on a bad day, but you're right, no one wants to hear it! Hi Katie! You said it! I'm still trying to get my bearings. I don't know if leaving a response to a comment on my own blog here will even get back to the person who left a comment! I'm starting off with baby steps for now! Welcome!! Blogger friends are fab, you will enjoy it! I've found alot of support online for my writing. Tips – well I agree with Lynda! Welcome, Talei and J.L. Thanks for visiting and signing up, and I appreciate your tips. So far, I'm getting a lot of support form the online community, so I'm off to a good start! 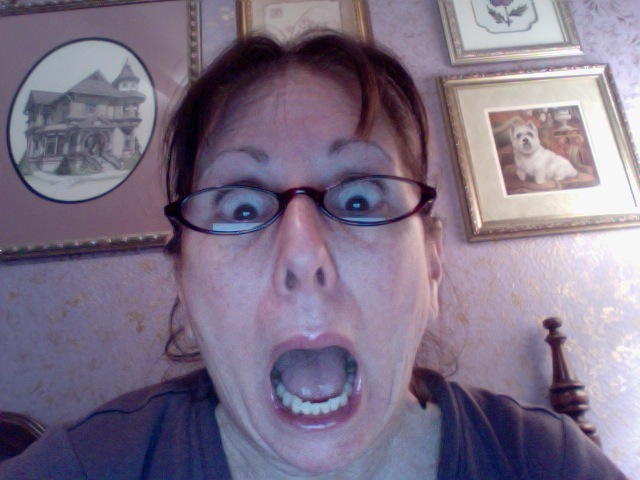 Lynn, I love that you're blogging now, and the pics of you are totally funny! I love it. 🙂 I know lots of people commented, but I wanted to share one of the things I myself have learned about blogging. Even if nobody comments on a particular post, that certainly doesn't mean nobody's reading it. You should always assume more people are following your writing that you think, because that's usually the case, and that's a good thing! So glad you stopped by, Tommy! Thanks for your comments. That's an excellent point for us to keep in mind, that there are always (hopefully) people who are reading the posts but don't have time to leave a comment. I'll remember that. Hi Alana,Wow, thanks for this site. I guess I have a lot, lot, lot to learn! I launched my blog with one post! And I just signed up for the Delicious bookmarking, but I'm not sure what that's all about yet! I'll take it one step at a time. No, I wasn't at the Getting Published meeting. Nutschell did an interview of BBH McChiller (of which I'm one-third!) so maybe that's why it seemed familiar. I appreciate your help. Alana, I just found your comment under the "comment needs moderation" section on my dashboard. Sorry it took so long to publish your comment. Aha, I have many new things to learn about running a blog! Jiffy, Sounds like you have a bit of Seuss in yer blood! Bet all those little booger bloggers would follow your absurdities. I hope I don't have a bog blog or a clogged blog! And a sad blog could cause a weeping soggy blog, as could spilling grog. And no one likes a blog hog. Love, love, love the "blogache coming on." I'll remember that one! With all these absurdities, this is now a groggy blog.